Malaria in Nigeria: "The children have a small chance of survival without us"
As malaria season hits the Nigerian city of Maiduguri, home to thousands of people displaced by conflict, Swedish doctor Mårten is fighting to save the lives of the most vulnerable children. I am in Maiduguri, in northeastern Nigeria. A city that, after the conflict between armed groups and the Nigerian army was stepped up a few years ago, has seen its population increase from one to two million as more internally displaced people arrived seeking safety. The situation has become almost disastrous. MSF was at first one of few international NGOs present, but now almost every big organisation is here, including the UN. But the situation for the many people here is still very hard. When I arrived at Maiduguri three weeks ago, we were in the middle of the malaria season. The pressure in the hospital is really high now. Patients are arriving in big numbers and many are in a very bad condition. On this latitude, where the rain falls between July and October, it means that the prevalence of the disease is worst from August until November. People living with such seasonal malaria do no become as immune as those living where the disease is found all year. Therefore, they often become sicker when they are infected. One morning, the five stabilisation beds in our emergency room are filled with 13 patients, aged from one month to 14-years-old. All of them close to unconscious, convulsive, with severe respiratory distress or in circulatory shock. Along with another doctor, I move from patient to patient, observe their breathing and their heart rate to quickly assess their condition and prescribe treatment. 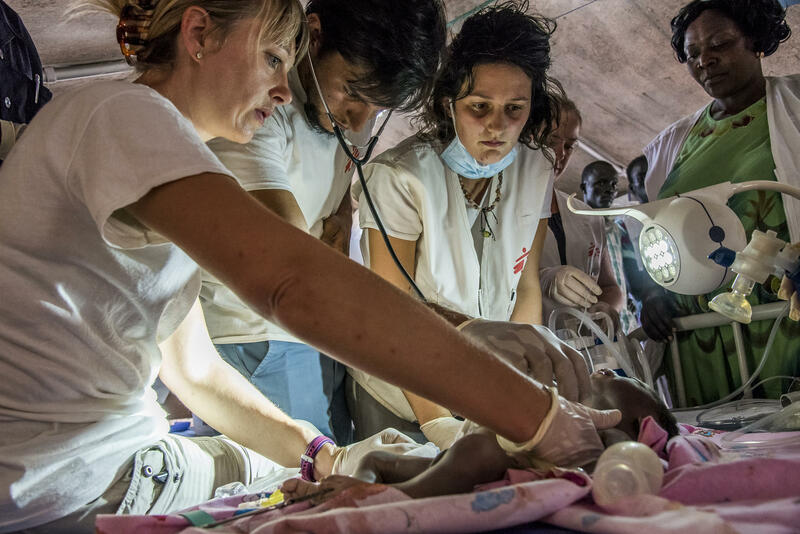 Two skilled nurses and two nurse assistants provide oxygen, take samples, put in IV lines, and give injections of malaria medicine, antibiotics and anticonvulsant drugs to the children. I then go to one of the three sauna-like intensive care units where we have oxygen. I count that in more than half of the 47 beds there are two patients. Those looking the healthiest are taken off the oxygen and moved to one of our six in-patient tents to accommodate the new patients arriving. I step out into the scorching sun and then into one of the almost equally warm in-patient tents. It’s also full, but several children are sitting up, looking around or eating away at a piece of fruit. And, if there is something I have learned in Swedish healthcare, with our chronic shortage of beds, it is to identify patients who can be discharged! Most of the 60 children we receive every day would have a very small chance of survival if they did not come here. When I think like that, it feels much easier. Every time I come here I feel happy to see patients who arrived in just as bad shape as the ones we have just received and how quickly they have recovered. Malaria is a fatal disease, but with proper treatment at the right time you quickly get well. After a round through the other departments we identify around 20 children who are ready to be discharged. This means children in the emergency room can have space, although maybe in a shared bed. When I come back to the emergency room, the team are resuscitating one of the thirteen children – a five-year-old boy with malaria that has led to severe anaemia, low blood sugar and sepsis. He was breathing heavily already when he arrived because of his acidic blood. Despite repeated attempts to correct the blood sugar and an ongoing blood transfusion, his body did not respond to treatment. Sadly, the resuscitation attempts are stopped. We go to take care of the other patients. About four children a day have died since I came here. Many of them could have been saved if we had more hands, more beds, and above all if they had come here before they had become so terribly ill. However, I'm also quite sure that most of the 60 children we receive every day would have a very small chance of survival if they did not come here. When I think like that, it feels much easier. Measles in Maiduguri: "It can spread like wildfire"